Smart Cities: Big Cities, Complex Governance? This chapter introduces the reader into the debate of smart cities and the role of governments in managing these cities. 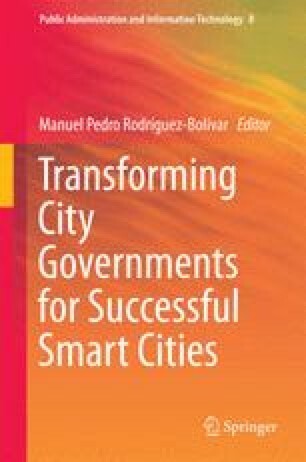 After reviewing the phenomenon of the smart cities, the chapter analyzes the need of local governments in managing these cities and the different patterns that these governments would take to make successful smart cities. Nonetheless, there are no conclusive solutions about this concern and much future research is encouraged to advance in this subject. Alcatel-Lucen. (2012). Getting smart about Smart Cities. http://www2.alcatel-lucent.com/knowledge-center/admin/mci-files-1a2c3f/ma/Smart_Cities_Market_opportunity_MarketAnalysis.pdf. Accessed 8 Dec 2014. Centre for Cities. (2014). What does it mean to be a smart city? http://www.centreforcities.org/blog/what-does-it-mean-to-be-a-smart-city/. Accessed 1 Dec 2014. Giffinger, R., Fertner, C., Kramar, H., Meijers, E., & Pichler-Milanović, N. (2007). Smart Cities: Ranking of European medium-sized cities. Vienna. http://www.smart-cities.eu/download/smart_cities_final_report.pdf. Accessed 1 Aug 2013.